Robert Montgomery was the only son of Alexander and Margaret Jane Montgomery. Alexander Montgomery and Margaret Crooks were married on 15th November 1884 in the district of Cookstown. Robert Montgomery was born 31st May 1887 in Cookstown. He was one of at least five children. His father, Alexander Montgomery, died on 30th December 1890 in Cookstown, aged 51. Robert was just two years old. Known family: Alexander Montgomery, Margaret Jane Montgomery, Mina Minnie Montgomery (born 9th March 1885), Ellinore Montgomery (born 7th March 1886), Robert Montgomery (born 31st May 1887), Norah Mabel Montgomery (born 3rd April 1889), Ethel Julia Montgomery (born 2nd May 1890). The 1901 census records the family as living at Derrinleagh, Orritor, Tyrone – close to both Drum Manor and Wellbrook. Robert’s mother was a widow and working as a farm labourer. Robert worked as a butler in County Cork and then in Merthyr, Glamorgan, Wales. By the time of the 1911 census, his mother was living on her own in Derrinleagh, Orritor, Tyrone. Robert Montgomery was married to Alicia Montgomery. They had three children. Robert Montgomery enlisted in the army at Pontypridd in July 1915. Private Robert Montgomery was serving with the 1st/5th Welsh Regiment, when he was killed in action at Gallipoli on 1st December 1915. 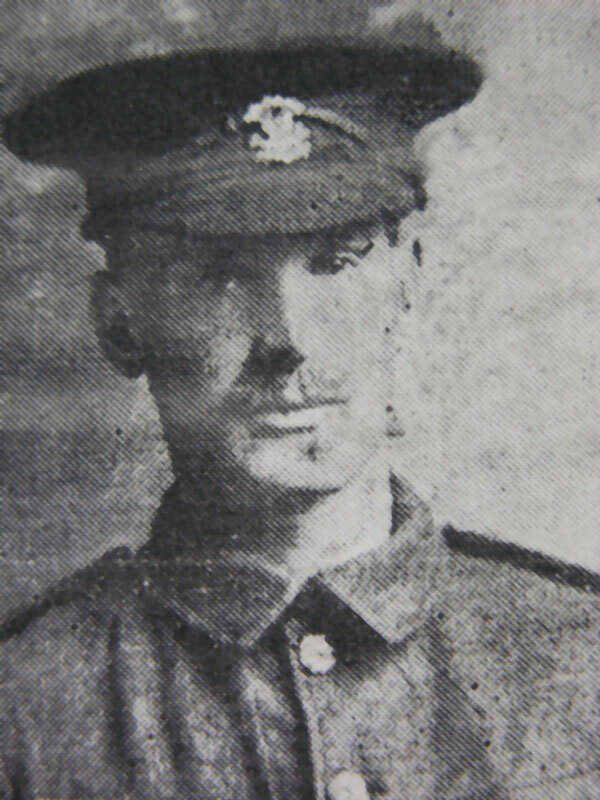 Welsh Regiment, son of Mrs M J Montgomery, Wellbrook, Cookstown, who was killed in action on 1st December 1915. He had been a butler in county Cork, and later in Wales. He joined the new army in July 1915 and was with the Mediterranean Expeditionary Force. He leaves a wife and three children. 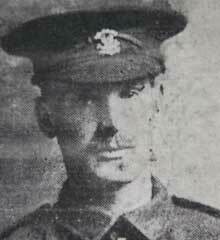 Private Robert Montgomery has no known grave and is commemorated on the Helles Memorial in Turkey. Private Robert Montgomery is also commemorated on Cookstown Cenotaph and Orritor Presbyterian Roll of Honour. 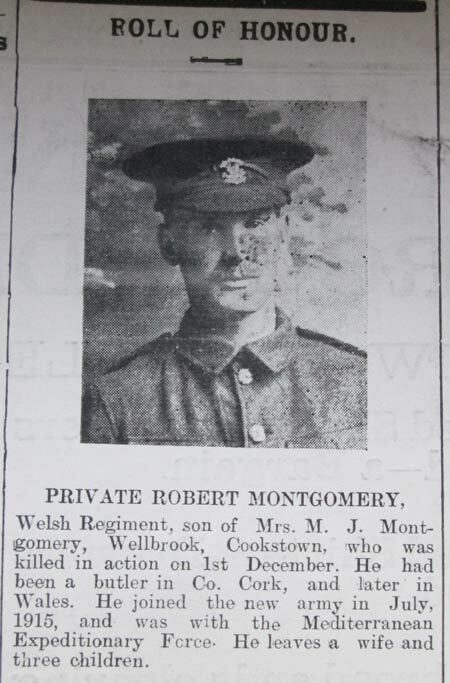 Private Robert Montgomery is not listed on Pontypridd War Memorial, where he enlisted. The CWGC record Private Montgomery as the son of Alexander and Margaret Jane Montgomery, of Wellbrook, Cookstown. The CWGC also record him as the husband of Alicia Montgomery of Drum Manor, Cookstown, County Tyrone.